The South Carolina Maritime Museum invites you to usher in the coming of spring and the arrival of boating season at the 9th Annual Burning of the Socks on Thursday, March 19, 2020 from 6 pm until 8 pm. In addition to the sock burning festivities, there will be Cajun Gumbo, raffles and door prizes, beer, wine, liquor, and live music by John Lammonds. The Burning of the Socks tradition began in the mid-1980s at a boatyard in Annapolis, Maryland. There, Captain Bob Turner, who managed the boatyard, got tired of winter weather. While working on boats all winter, his socks collected sawdust, bottom paint, caulk, and other boatyard leavings. In other words, his socks would stand up when he took them off at night. One year, on the first day of Spring, he took off his socks, put them in a paint tray, sprinkled on some lighter fluid, lit them, and then had a beer to celebrate. And so the tradition began, and there are now sock burnings in coastal communities across the country. Tickets for this "fun"raiser are $30 for museum members and $35 for non (but soon-to-be) members. All proceeds will benefit the SC Maritime Museum. For more information or to purchase tickets call the South Carolina Maritime Museum at 843-520-0111 or purchase tickets online here. You do not need a PayPal account to purchase tickets. When you arrive at PayPal, skip the "Log In" button on top and click on the gray "Pay with Credit or Debit Card" button on the bottom. The South Carolina Maritime Museum invites you to usher in the coming of spring and the arrival of boating season at the 8th Annual Burning of the Socks on Thursday, March 21, 2019 from 5:30 pm until 8:30 pm. 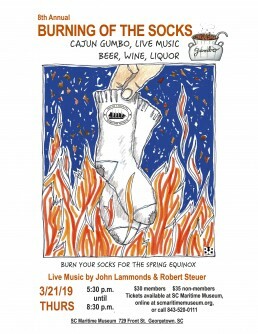 In addition to the sock burning festivities, there will be Cajun Gumbo, raffles and door prizes, beer, wine, liquor, and live music by John Lammonds and Robert Steuer. 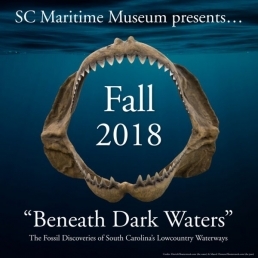 "Beneath Dark Waters" The Fossil Discoveries of South Carolina's Lowcountry Waterways exhibit can be viewed Monday through Saturday from 11 am until 5 pm. The exhibit is located on the second floor of the newly expanded and renovated museum. Admission is free to the public. Donations are appreciated. For more information about this exhibit click HERE. This event is by invitation only for museum members and guests of the 2019 Wooden Boat Show Featured Artist. Join us Sunday, October 20 for our 6th Annual Opti Regatta. There will be three races from 11 am until 1 pm. The top two winners from each race will qualify for the FINAL RACE at 12:30 pm to determine an overall winner. Sailors will need to arrive at check in 15 minutes prior to their race with a USCG approved life jacket and dressed for the weather. Sailors will be escorted down to the docks and our volunteer will review the course with them. This is a wonderful opportunity for our sailors to show off their skills and have some fun during this great community event! To register, contact Hope McFaddin at sail@sc-mm.org or 843-520-0111. Join us Sunday, October 21 for our 5th Annual Opti Regatta. There will be three races from 11 am until 1 pm. The top two winners from each race will qualify for the FINAL RACE at 12:30 pm to determine an overall winner. The Georgetown Wooden Boat Show – always held on the third weekend in October – features one of the Southeast’s best wooden boat exhibits with more than 130 wooden boats displayed on land and water, children’s model boatbuilding, knot tying, maritime art and crafts, food and music. A special attraction is Saturday’s Wooden Boat Challenge when teams of two race to build a rowing skiff within a 4-hour time limit and then test their boats for seaworthiness in a rowing relay on the Sampit River. Sunday is a fun-filled family oriented day that includes a Cardboard Boat Regatta, and an Opti Pram Regatta. Check our schedule of events for updates and be sure to book your stay at HammockCoast.com. The Wooden Boat Show takes place on the waterfront and along Front Street in Historic Downtown Georgetown. The Show is produced by the Harbor Historical Association, a 501(c)(3) tax-exempt organization. Proceeds will benefit the South Carolina Maritime Museum. Watch the boat parade from the back deck of the museum. Parade begins at 6 pm. Enjoy chili, snacks and libations provided by museum board members. This event is free for our members. New members are welcome. Dress is casual.